DAEGU -- With the aim of turning the former textile-industry city into an epicenter for the future car business, the Daegu city government held an international exposition on green and self-driving vehicles Thursday, with automakers and parts makers joining the drive. The second Daegu International Future Auto Expo, which kicked off for a four-day run jointly hosted by Daegu City and the Korea Academy for Automotive Engineering, attracted the participation of 248 companies from 22 countries at Exco, according to organizers. In the opening speech, Hyundai Mobis President Lim Young-deuk gave an overview of the company’s business portfolio and future plans involving autonomous driving, connectivity and eco-friendly technology. He added that Mobis will allocate about 50 percent of investments by investors to the information and communication technology sector, and raise the number of ICT research personnel 1.8-fold by 2020. Some 500 industry experts from in and out of the country were present at the opening ceremony, including Alexander Morozov, Russia’s vice industry and trade minister; Simon Smith, British ambassador to Korea; and Daegu Mayor Kwon Young-jin. Mobileye’s APAC & Africa director, Nimrod Dor, who also attended the event, named two local firms in the auto and ICT industry, Kakao Mobility and SoCar, as having recently caught his interest. Kakao Mobility is a new carpooling service to be launched year-end, and SoCar is Korea’s leading car-sharing firm. “I think there are many local good companies … like Kakao Mobility, which is trying to do all kinds of taxi services on demand with the app. It can eventually evolve to autonomous vehicle on-demand services,” Dor told The Korea Herald at the DIAF 2018. Mobileye is the Israel-based driver assistance systems provider owned by Intel, and currently supplies cameras for Hyundai Motor’s ADAS system. Vincent Wijnen, senior vice president of Nissan Asia & Oceania, meanwhile, took the stage for the second opening speech, describing Korea as a country that will lead electric vehicles in Asia. “Korea, as a technologically advanced country, is in a prime position to lead the era of electrification in the region,” Wijnen said. “So for countries in Asia that have the economic and infrastructural means to embrace newer and cleaner forms of energy, Nissan is highly committed to making our vision of electrification a reality,” he added. 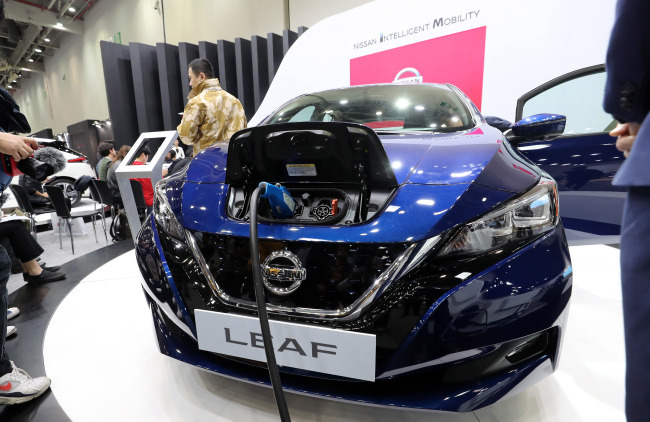 At DIAF 2018, Nissan unveiled its second-generation EV Leaf while Tesla exhibited its latest Model X sport utility vehicle. Global automakers Hyundai Motor, Mercedes-Benz, Jaguar Land Rover and others also took part in the event. The new Nissan Leaf, a fully renewed model after seven years, is set for launch in Korea around March. According to Nissan Korea, the Leaf EV was the world’s first mass-produced fully electrified vehicle, launched in 2010. About 370,000 units had been sold worldwide as of late October, it added. Running on a 40-kilowatt-hour battery, new inverter and high-capacity electric motor, the electric car has a driving distance of 231 kilometers per charge. 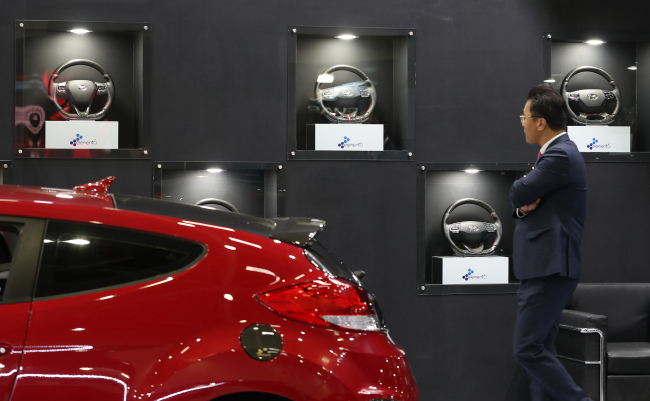 Nissan Korea said the price of the Leaf has not been decided. Also taking center stage at the event was Tesla’s Model X SUV with futuristic gull-wing doors, unveiled here in August. Containing a 100-kilowatt-hour battery, a first among Tesla models, the SUV can drive 386 kilometers per charge and accelerate to 100 kilometers per hour in 4.9 seconds, the company said. The five-seater SUV is also available as a six- or seven-seater, depending on which option the consumer chooses. Tesla’s decision to not apply for a green car subsidy worth about 20 million won ($17,600) for the Model X, which comes with a price tag of 113.1 million won for the 75D and 134.9 million won for the 100D, had drawn complaints and criticism from customers. Hyundai Motor, South Korea’s leading automaker, exhibited the Nexo FCEV, Kona Electric and Ionic Electric accompanied by a zone for children to better understand hydrogen as well as a model of the Nexo displaying its interior structure and safety, the company said. From the diplomatic community, the UK Embassy in Seoul was present, as part of its “Automotive is GREAT” campaign, which it has been running for over a year in efforts to promote the UK’s auto manufacturing, R&D and future mobility.